Hailing a Taxi down Cockup Boulevard. Update: Sept 2014: Someone did some further analysis. 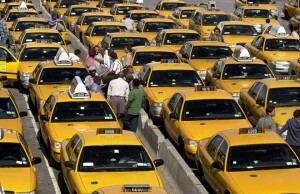 It took 10 hours, from the release of ineffectively anonymised driver numbers, to extract the driver IDs of 173 million taxi journeys in New York City. That data, released by the NYC Taxi authority has been also been used to do useful things, but what else will be done with the rest of the fields? What else could have been done?